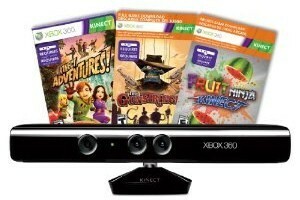 Kinect Bundle: Sensor + 3 Games for $99.99 + Free Shipping! Ohh, what a great deal! Don't know how long this will last though. Head on over to Amazon and you can get a Kinect Bundle for only $99.99 plus free shipping! The bundle includes the sensor, Kinect Adventures and token codes for downloadable versions of Gunstringer and Fruit Ninja Kinect games, power supply cable and manual.